Kyan Chofu in a publication of 1915. Kyan Chōfu distinguished himself in the bugei (martial arts) and owned an extraordinary physique. After he had moved to Tōkyō in 1881 as a vice-steward to Shō Tai, the last king of Ryūkyū, he never neglected the practice of the bugei. Even on chilling cold winter daybreaks, with the cold wind blowing down from Mt Tsukuba (tsukuba-oroshi), he would go out to the courtyard to practice thrusting the straw post (makiwara), karate, kenjutsu, as well as other martial arts. Only after finishing practice he would go back inside to have breakfast, during which he easily consumed the extreme quantity of 10 bowls of food, or five pound of pork during one meal, which is indeed astonishing. It is interesting to note that – according to the 1915* source – he practiced kenjutsu. This is not found in the modern oral narratives of karate. 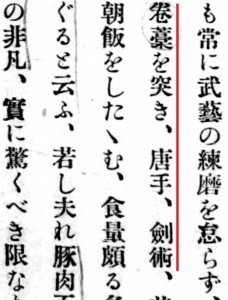 Instead, while his son Chōtoku is not mentioned in this article, it is today popular writing that “Chōfu often took his son Chōtoku outside on cold winter days to practice karate“. 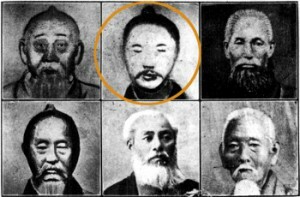 *Shō Kyō: Haihan Tōji no Jinbutsu (Characters at the Time of the Abolition of the Feudal System). 1915. © 2016 – 2017, Andreas Quast. All rights reserved. This entry was posted in Unknown Ryukyu and tagged Kyan Chofu, Kyan Chotoku. Bookmark the permalink.